During the past 2 weeks the team here has noticed a higher than usual number of requests for quotes for email templates. We are typically asked for a quotation – which has two options:- one for a mobile-optimised (responsive) layout and another for a none-responsive one. I must admit that I am still amazed by the fact that some organisations are still considering sending non-responsive emails to their target audience. Shouldn’t all commercial emails be responsive nowadays? In my previous blog I referred to a study by Google which suggests that Australia has one of the highest levels of mobile penetration in the world. More recent research, conducted by email testing and analytics provider Litmus, suggests that 47% of emails are opened on mobile devices -with some major brands stating that up to 70% of their emails are viewed on mobile. These statistics not only show how well mobile devices have been adopted by Australians but also how people are increasingly consuming information and reading emails on-the-go. With the variety of mobile platforms and screen sizes available, there is a high risk that poorly crafted email layouts can be hard to read and eventually ignored or deleted. A responsive layout should prevent this from happening and will ensure that email recipients enjoy a consistent level of experience across devices and platforms; encouraging interaction and ultimately contributing to better ROI. With these facts in mind, you should be able to increase customer engagement and click through rates by following these 3 simple rules. 1. Write and design for mobile first. Keep sentences short, use simple words combined with powerful imagery. Remember, images speak louder than words. 2. Aim for optimal experience across devices. Ensure that outbound links and landing pages are mobile optimised as well. 3. 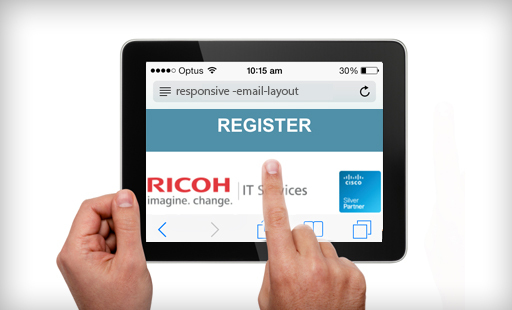 Test, re-test and then re-re-test your email on several platforms to minimise bugs and display issues. Remember to apply these 3 rules when creating your next email campaign. But more importantly you should start thinking of responsive email layouts as standard practice rather than an option, as choosing to go responsive can determine whether your campaign ends up being a success or a complete failure.